Cupcakes 'n Daisies: It's Tools Tuesday . 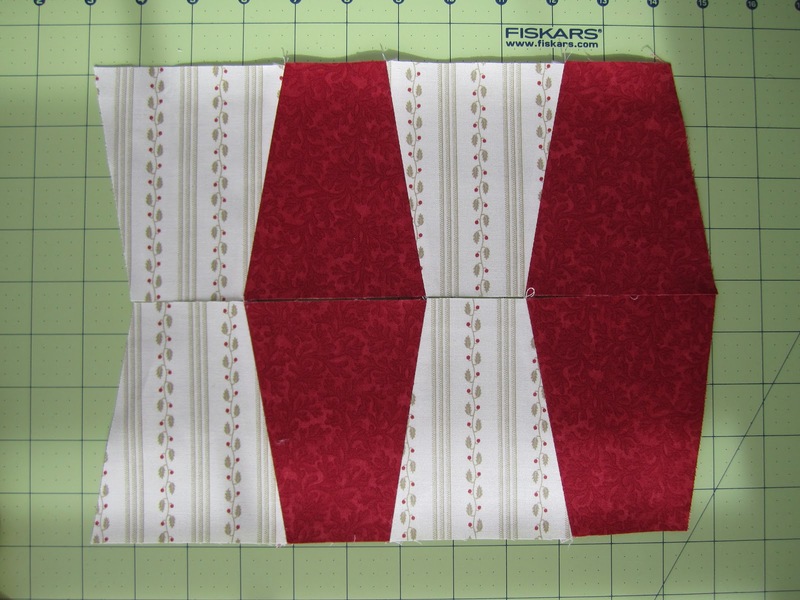 . .
"The Crumbler" is a tumbler template created by Carrie Nelson for Miss Rosie's Quilt Co. Guess who came up with that interesting and distinctive name, ME! For some reason I just love to name things, and I'm constantly trying to name and rename things for folks all the time, even when they don't ask for my input. It must be genetic, my brother does the same thing, he calls no one in my family by their given name, it's always something else, to my brother I'm Lulu! Anyway, this summer, when Carrie told me she was working on a tumbler template, I immediately ask, "What's its name?" She was up in the air but leaning towards some sort of practical name. Well I came up with "The Crumbler", C for Carrie, R for Rosie and Umbler from tumbler. Carrie got a good laugh and moved on. But then my name sort of caught on, and folks said they liked it, and then Carrie decided she liked it too. So "The Crumbler" it is, for now and for forever. I'm hoping this template becomes so popular that "Crumbler" is someday recognized by spell check. Before today, I had never played around with tumbler blocks. I bought a tumbler die for my Go Cutter but had not used it. When Carrie mailed me the template this summer, just the ruler, no instructions, I looked it over, thought it looked nice, and threw it in my tools drawer. I didn't even take the plastic off! This week I got my first look at the directions (8 pages of directions) that come with this ruler, and let me tell ya, I was digging that ruler out of my drawer and ripping the paper off and making blocks in no time. I'm amazed by the possibilities and versatility of one little block. Cutting the blocks is a piece of cake and like most other templates just decide on your size and cut your strip accordingly. Then just line up the template and cut each piece. You can cut several layers at once. I put a little strip of double sided tape on the back to keep the ruler from sliding. I do that with all my templates. You can make tumblers that measure 3", 3 1/2" ,4", 4 1/2", 5", and 5 1/2" from top to bottom. The directions provide information on cutting regular, pieced, horizontal strip, vertical strip, 4 patch, jelly roll, and mirror image tumbler blocks! That makes for some very interesting tumblers! There is also a table telling you how many tumblers you get from each specific strip width. Not that that isn't something you can't figure out on your own, but how nice to have it provided. So the cutting was a piece of cake, next up the piecing instructions. The instructions are easy to follow and come with wonderful illustrations, but I had my doubts that I would get it all right the first time. Here are the directions, "Joining the tumblers is easy - once they get lined up properly. And that's easy too - just find the right starting point". Basically the corners don't line up, it's up to you to align the edges and offset the corners. You offset enough to where your needle comes down right where that"v" is created when sewing a 1/4" seam allowance. I followed the directions and my tumblers came together perfectly. I didn't realize how many different patterns you could create using these blocks until I got my instructions. How about opposite fabric but top to top and bottom to bottom, matching seams. How about same fabric, top to top and bottom to bottom, matching seams. More of the same . .
Maybe off-set is more to your liking. There are a lot of possibilities! There are also instructions on cutting and piecing the perfect side setting pieces. and sewing, it could not be any easier. See how perfectly that side piece fits on the end of that row to create a straight finished edge. there are directions on how to cut a narrower tumbler. There are also instructions for making a quilt with two different sized tumblers, along with fabric requirements. The template is precise, easy to use, and fun to play with. But the best thing about this template is the directions that accompany it. Do you remember all summer, most every time I would try out a new tool, how I would have to look online for additional directions, because the directions provided with the tool were so lacking, and then, after figuring out how to use the tool, I would usually end up saying something like, "well it works, but I don't know what I would make with it". The instructions that come with this template explain how to use it and give several patterns and suggestions on what to make. It's almost like they were written for a quilter, imagine that! I'm not sure I see a whole tumbler block quilt in my future, but I definitely plan to work on a tumbler block border, maybe in my 100th quilt. If you're a tumbler novice, like me, you'll love this template and the directions, you'll be a tumbler pro in no time. If you are already an experienced tumbler quilter, I think you'll love the accuracy of the ruler and the size options it gives you. You can buy your own "The Crumbler" from several online stores like The Fat Quarter Shop or Carrie's online shop, it runs around $13.50. Give-away now closed. Thanks for stopping by. 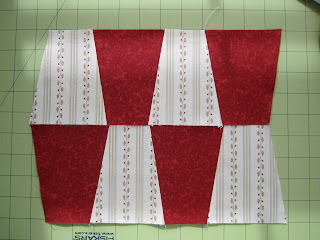 Disclosure - Carrie Nelson of Miss Rosie's Quilt Co did not ask me to blog about this template and is not providing the templates for my giveaway. I did receive one template for my personal use, a fair exchange for providing that excellent name I think. I have made several quilts with the Accuquilt dies. It would be great to be able to do multiple sizes. I have a few new quilting books on my Santa list this year. I haven't asked Santa for anything, but am hoping my son will be able to get time off from his job so he can fly home and spend time with us. Anything that makes quilting easier is always great! A fabulous review and congrats on being the namer of the tool! I have only made a tiny tumbler in the past, but I can see that tumblers would be a great border idea for a scrappy quilt. I asked Santa if he could fit some quilting books in his pack I can read those while sipping on a cup of coffee from the new coffee maker I hope to get! Just got my Christmas gift - second grandchild - Vivian Leigh born on Wed - she is a gift! Mom (my daughter)and baby doing great. Can't ask for more than that. I am hoping for some Tula Pink Octopus fabric for Christmas, lol! I haven't asked for anything but will be so glad to see my son as he is working out of State and I haven't seen him for four months! And the fact that when he gets home, he can help me move into my new sewing studio but he doesn't know that yet! What a wonderful name and a wonderful template too. 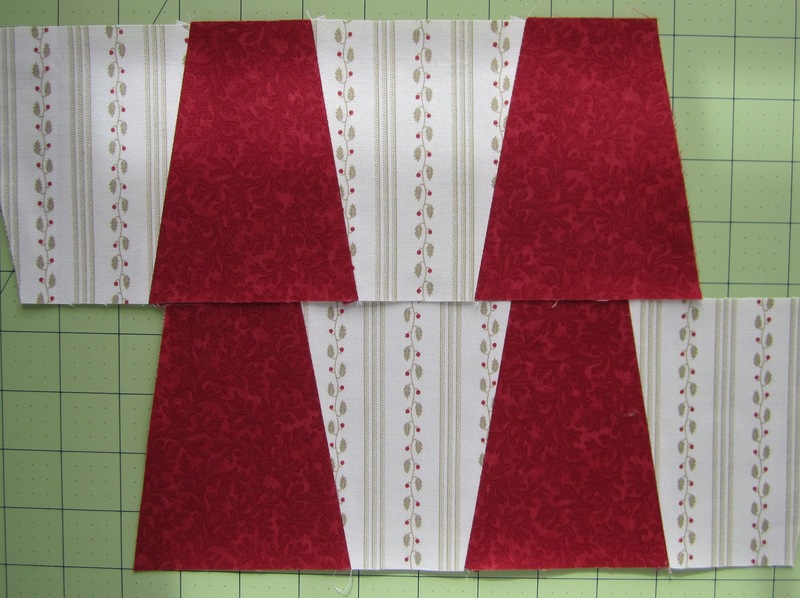 You could make short fat ones, or tall skinny ones, you could decorate them like Christmas trees on a quilt too! I hoping for a koala sewing table to enlarge my quilting area. Love your blog! It IS a most excellent name! I appreciate the review and the demo. This is going on my Christmas wish list. I'm asking Santa for a gift card to buy lots more fabric! Like i need more....thank you for a great giveaway! Well, I'm hoping I'll win a Crumbler for Christmas! (hint-hint!...LOL!) I loooove the name...Just fabulous! Thanks for the chance to win this great giveaway! I'm also hoping Santa will bring me gift cards for more fabric - or maybe a Crumbler! Love your review, and I have some fabric in mind to make using this tool. Thanks for the chance to win one. oh my gosh ... i had NO IDEA that your other name is LuLu!!! yeah, yeah, i know - this post is about the brilliant template named The Crusher - but i'll read all that stuff later ... when i can concentrate on something other than the fact that two of my most favorite people in the Entire World share the same name ...... AND when my heart stops palpitating because my brain tried to wrap around this being Tools Tuesday when it is actually friday and i cannot even THINK about it only being tuesday because i do NOT want to go through this week's wednesday and thursday again ... fer shur. Thanks for the review - isn't it nice to find a tool that you know you will use!? I haven't made a tumbler yet, but would love to give it a try. My Christmas wish list is short this year - a few quilty things from Primitive Gatherings and Kim Diehl's new book. I just ordered one from FQS. Just wanted to leave a comment about its great name!! Move over, Carrie. Lulu might have just taken over the Naming Throne! I asked Santa for a new TV for sewing room also!! Want a small flat screen. I have a tumbler template I used once but it doesn't have any markings on it for different sizes. This one is SO much nicer with all the markings on it. Thanks for a chance to win. ~Jody R.
I don't plan to ask Santa for anything, seeing how every year he brings my husband and me a 17 game ticket plan for the Phillies! However, seeing the Crumbler, I may have to see if he can slip one in my stocking...this looks like fun! I have two requests from Santa, one is a new pair of slippers (the soles fell off the last pair)and a gift cert from my LQS, Ruth's Stitchery! Really, though, I would be happy winning this new ruler! All I'm asking Santa for is time to spend with my two grown children in other states. One is a quilter and we spend time quilting together when she's here making things for the daughter that doesn't quilt. We are so blessed to have everything we need that I really don't need to ask for anything. Love reading your tool reviews and watch your quilts come together. I have always considered a tumbler quilt, but haven't made it a priority on "the list." But with THE CRUMBLER" it looks so easy. I am thinking I could make a scrappy quilt with it. I could use up more stash making more room for all the precuts I am asking Santa for. :) PS. I like your idea of a tumbler border too. Hmm....so many ideas and so little time. What a great review! The instructions sound just like you'd expect from Carrie: thorough, well-written and with lots of alternatives and tips, together with, I'm guessing, a good dose of humour to make them easy and enjoyable to read. I love the name (bravo!) 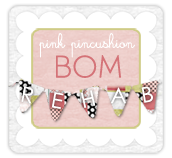 and your idea of a tumbler border is definitely a good one! I've asked Father Christmas for a portable ipod dock so I can listen to audiobooks/CDs/digital radio while I sew, no matter where I am in my house - hope he got my letter! I am asking Santa for a roll of batting. Thank you for your reviews. They are so helpful. I've been wanting to make a tumbler (crumbler)quilt for quite awhile. This template may be just what I need. I already got my Christmas present this year. My daughter just got home from New Zealand after spending the last 6 months there. Although I'm sure Santa won't forget me. I am hoping just to be able to buy some gifts for kids. I will be happy with that. I am asking for quilt cash. I am going to Road to California next month and need $'s. I do,want to make a tumbler quilt! I LOVE the name for the ruler. Thanks for the chance to win and happy holidays to you and your family. Thanks for the review. 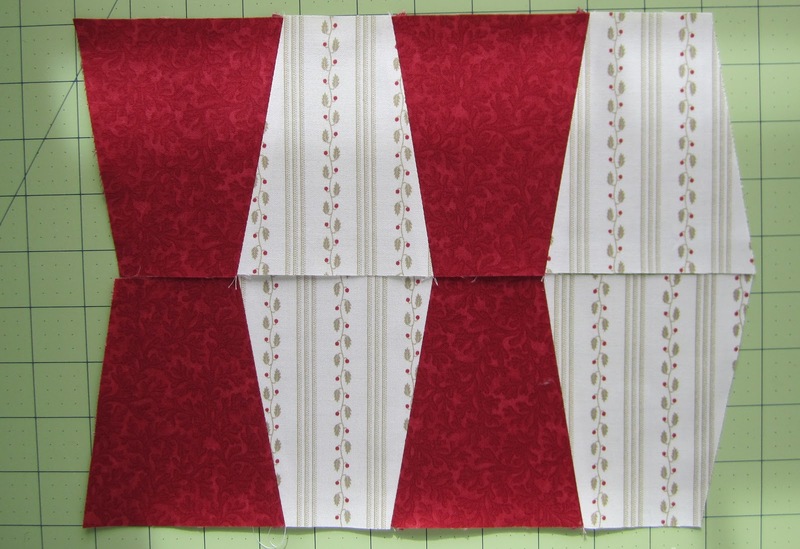 I have the die for my accuquilt and have used it a lot so I think I would really like this ruler for more variations. What do I want for Christmas - good health for the year! I have never done tumblers before. I am not sure how the offset corners work. Do you just know where to line them up or is there a notch? Hhmm. . . may have to look into this. Or maybe if I win I will look into this. I'm thinking this could be another fun tool to use with pre-cuts. Great name, by the way! just what I need...another ruler...but with a name like crumbler it combines quilting...as food??? am I the only one who gets hungry when I hear "crumbler?" I've asked Santa for several quilting books plus a bundle of fat-quarters. HI! THANKS FOR YOUR BLOG POST! ASKING SANTA FOR "MORE FABRIC"! NEAT TOOL-THANKS FOR A CHANCE TO WIN! Thanks for the blog post - this looks like a neat tool. I'm going to order one if I don't win one! Thanks for the giveaway chance. Great tool! For Christmas I am wishing for a new coffeemaker!! Thanks so much for the great tutorial! I love tumbler quilts, especially scrappy ones. Fun name! Lucky enough to not be asking for much, but a few new baking pans from Williams Sonoma - they have some really nice ones I love and am hoping to phase out my old ones with the good stuff! I'm not asking Santa for anything this year. He has been very generous all year long and needs to think about others for Christmas. I love the name Crumblers! I love tumbler quilts so this template is a dream! I just saw 3 Sisters is releasing their Paris Flea Market line again - it was one of my favorites and I want a bundle! I'm hoping Santa leaves me one under the tree. I'm looking forward to trying this template. I've always loved tumblers and have been wanting to make a tumbler quilt. As for Christmas--haven't even given it a thought as we have just sold our home and moved to a temporary rental while the new home 150 miles away is being built. DH will be working at a new facility that is also still under construction. So I guess my Christmas present is my new house and big studio I am getting. Wow, that tool looks like the best thing since sliced bread! Oh I hope I win. I WANT to try it!! Thanks so much for the giveaway! I've always shied away from this block, so I'm thinking a good template with great instructions would be a great Christmas gift! I love tumbler quilts, especially made from Christmas fabric scraps! I am asking Santa for an addition to my house, just a small addition to the family room, so that I can move the sewing mess out of the dining room! But I don't think there is room for that in the sleigh! I would settle for a Crumbler template from Santa. I would like Santa to bring me my dream vacation, but I would settle for a safe holiday season for everyone. My DH doesn't like to shop so I always ask for a gift card to my favorite quilt shop. I've made a mini tumbler from a cardboard template so the Crumbler would be a fantastic win, thanks for the chance. My brother and I always exchange gift cards. I get him Amazon and he gets me FQS. The perfect gift - every time! I have to make myself wait to use it until at least everyone else has had their chance to open the gifts under the tree. 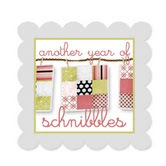 I already see so many things I like with the new releases and precuts available this week! I would love to win the ruler! Thanks for the giveaway! All I want is a stress-free, low key holiday. Oh, and a Crumbler! I haven't asked for anything, but I am always open to some fabric or gift cards to use for fabric. I can't see my husband picking out fabric, so I am sure it will be money or a gift card. :) Thanks. I love your blog, I look at it most everyday to see if you have put something new up. I love that Crumbler (perfect name). I don't NEED anything, but I do like more fabric and books. My family thinks I have too much fabric already, so I'm not sure how I can talk them into feeding my habit....gift certificates maybe. I want a new/reconditioned Ipod touch to replace my dying one. I use it to listen to audiobooks when I fall asleep. I have a hard time falling asleep and listening to books (esp. with monotone readers!) helps a lot. I'm getting a new range hood. Pretty exciting. Last year I got the new tv for my sewing room. I love it but find myself leaning on my elbow watching tv when I should be sewing. I would love to become a tumbler pro. I've never made a tumbler quilt but I think it would be neat out of scraps. I would like hardwood flooring to replace our carpets. I read about the Crumbler on Carrie's blog, but didn't realize that you had named it. It looks like a great tool. Thanks for the review and for the giveaway. I would love Santa to bring me a new Bernina sewing machine! Thanks for the give away Thelma! I always love Miss Rosie stuff!!! Crumbler... What a clever name! Mine is on it's way... so don't enter me into the giveaway. You are the one who came up with that name? I love it. That was so creative... and so perfect! C (for Carrie) R (for Rosie) and umber... for tumbler. Wha-la! Crumbler. I made one tumbler quilt from charms with a FT&C. pattern and have been wanting to try other variations... can't wait to see what people make with the template. Good luck to everyone!!! What a handy tool the Crumbler is! I've used paper piece tumblers, but this ruler would speed up the process! Thank you for the tutorial. I would like Santa to bring me a gift card to the Fat Quarter Shop! I am getting a Janome 6600 for Christmas. I would love to win a Crumbler. Thanks for the chance. I'm wishing for an upgrade to my embroidery software. I've seen "tumbler" quilts at shows but did not know how to make one. Your idea to use the piece in a border would certainly add interest to a quilt. Love your blog, Thelma. Thank you for having a give-away for this new tool. I'm just asking for all this "spare time" in retirement to put in an appearance! Love your blog! I'm hoping Santa will bring me a cable hook up in my sewing room. I love to have the TV on for company but I think I've watched every DVD I own about 20 times. Cable would be nice! I asked Santa for a new laptop this year. He was very good to me, I picked it up yesterday. Thanks for the chance to win one of these Thelma. I love the name!! This makes tumblers seem very achievable. 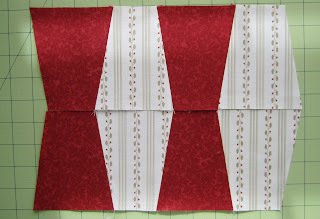 I am hoping Santa might put an accuquilt die or two in my stocking! I can think of a ton of things to make with that Crumbler, looks like a ton of fun. I saw Carrie's post on this earlier this week and added to my Christmas list! I haven't made any tumblers but Carrie made it seem possible. On my Christmas list I also have EQ7 and fabric. Thanks for the review and for the chance at your giveaway. I would love to use that for borders! What a great idea. 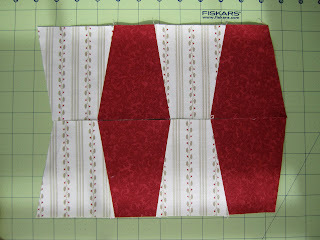 Of course, I think I would like to make a scrappy tumbler quilt too. My Christmas wish is for a couple new books. I love quilting books! Thanks for the fun! I have a shoebox full of Charm Packs (that I LOVE!) that I'd love to try The Crumbler on! I'm hoping Santa (aka DH) will get time to make the new cutting table we designed. I have really enjoyed the Tools series you had. Thanks for another installment and the chance to win one. It looks like so much fun. OOOH, since Carrie put that template on her website, I've been drooling over it when I go to check out her new patterns! It is so much more versatile than most tumbler patterns! I'd love to give it a try! I've already asked Santa for a rolling chair to use at my sewing machine. Hope I get one!! I've been very good! I'm hoping Santa will be bringing me a new I pad. Love this new little ruler, would like to try it! Great review! And thanks for the giveaway. I'm asking Santa for a Tutto bag to take may beloved bernina to classes/bees/etc. I want it in RED because that is my favorite color. I've heard that several other quilters, you included, also like red!! Now I'm thinking a Crumbler would be a great stocking stuffer. Great review...I have to get one!! That Crumbler tool looks so fun. I have never made a tumbler quilt but love the look of the 2 different widths together. I have a couple of books on my Christmas list. Looks like a great quilting tool. I already received my Christmas present, a new Bernina 750 QE sewing machine. I've been spending this week becoming acquainted with my new friend. My old friend is 30+ years old and a Bernina 830. Loving the dual feed and 10 inch harp on my new friend! Hi! We need to sell our house so I'm closer to meeting my retirement plan, so I'm asking Santa for a new sewing room in a new house! So, I need a buyer, not a gift! Thanks to you and Carrie for the giveaway, the ruler looks great! I just heard about the Crumbler this week--I think it looks like a great new tool and I hope I win, so I don't have to wait for the LQS to get them in. I think I'm asking Santa for some sort of e-reader, but that idea just came to me a few days ago, so I haven't done any research yet. I love the Crumbler and how it got it's name! Would love to win it. I asked Santa for some soaps from L'Occitaine and a Leslie Sansone exercide DVD. Gotta keep moving. That sounds like a fun ruler-and I love the name! I've never made a tumbler quilt. I secretly wish Santa would bring me a new car, but since I know that that won't happen, I would love some precuts of Moda's newest fabrics. Thanks for the fun giveaway! I was so busy at work I almost missed your giveaway. I just got off the phone with my sister that was struggling with a gift for me and I had her order the Steady Betty ironing surface and a Blackbird design book for my present. I don't know why she struggles so much with a present when she knows that anything quilty is a win! LOL! We all make wish lists on amazon and then share the list with everyone. It saves so much time! With Amazon's universal wish list we can put things from any shop online and we make sure we have items in every price range to accommodate everyone's budget. It has worked out so well for all occasions (mother's day, birthdays, xmas) that my daughter's best friends and her hubby have started using it. My sister just has trouble deciding what to get among the list. Told her she could always break down and get me the Nikon D7000 I have on there. LOL!! Looks like a really cool new tool! I love tumbler block quilts and this would make it so easy to put one together. This will definitely go on my wish list! That is so cool that Carrie used your name! I would love cabinets for my sewing room. Love the tool and the tool reviews! Thanks for the chance! I am hoping for anything Brighten (the jewelry,charm handbag place?) the Jennifer Chiaverini book that I don't have, and time to finish that quilt stretched out on my long arm! Merry Christmas and Happy Holidays, everyone! Can't wait to try it out...I have always wanted to make a Tumbler quilt! Smile! I am asking Santa for a lightweight sewing machine to take to my quilt group meetings. My beloved Bernina is just too heavy to move! Great name, great ruler! I'm asking Santa for a new serger. I have one that I am passing on, but mine doesn't have differential feed for gathering. Thank you for the info on the Crumbler, it is one I'm considering ordering but sure wouldn't mind winning one. I'm not really asking for Santa for something, just time with my family!